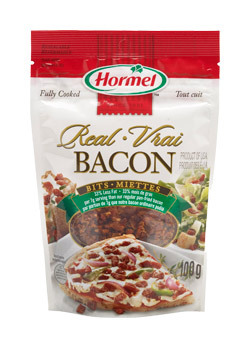 Hormel® bacon toppings are made from 100 percent real bacon and are sold in bits, pieces or in crumbled form. 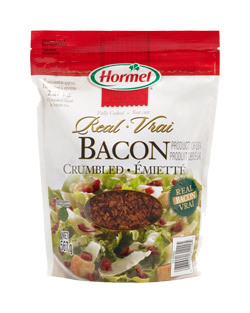 They have a moist and tender texture that adds an intense full bacon flavour to salads and recipes. 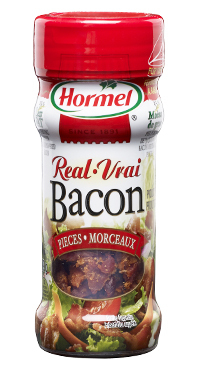 Packaged in either vacuum sealed jars or a resealable pouch, they offer convenience with 33% less fat than pan-fried bacon. 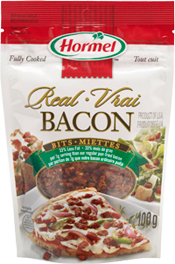 If you really love bacon, you can use Hormel® bacon toppings to add flavour to a wide variety of recipes only limited by your imagination.